Small rooms are a reality for most of us. But just because you live in a small space it doesn’t mean you have to feel cramped. Here are 8 ways to make a small room look bigger. People always try to cram a lot of small furniture into small rooms, but to make a small room look bigger it’s best to use larger pieces of furniture, but fewer of them. For instance, in a small living room, instead of trying to fit in a sofa, chairs, ottoman, coffee table and side tables, try using a regular-size sofa, a large ottoman that doubles as a coffee table, and perhaps a single side chair. If you have the space you can even include a large armoire for storage (closed storage will look less cluttered than open storage). Get rid of excess small pieces and instead include only what you need. Aside from using fewer but larger piece of furniture, there are a few other things to consider. Try having at least one or two pieces the same color as the walls. The furniture will blend in, making the room feel bigger. Large upholstered seating looks lighter and creates a sense of space when on raised legs. Avoid anything too boxy. Glass (or acrylic) furniture such as waterfall tables and Ghost chairs take up negative space, making rooms feel less crowded. Clutter is a big no-no in small rooms. Make sure everything has a place and everything actually stays in its place. Keep small items like remote controls in storage baskets or boxes, avoid excessive accessories, and don’t allow things like newspapers and books to lie around on tables. In a small space, even the smallest amount of clutter will affect the overall look of the room. Good lighting may be the single most important element in any room, and natural lighting is always best. Not every room has a ton of it so do what you can to maximize what you’ve got. Hang curtains outside the window frame so that when the curtains are open none of the window is covered; keep any window treatments light (both in color and fabric); and if possible, hang a mirror on the wall across from where the window is. The natural light will be reflected making the room feel bigger and brighter. Mirrors are great for reflecting light and creating the illusion of more space. 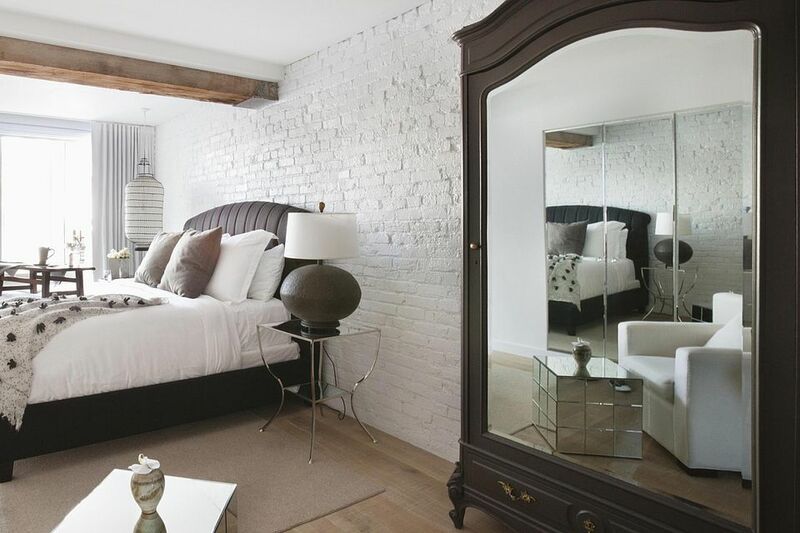 Placing a large mirror near or across from a window is always effective. Another technique is to choose a focal point and then angle a mirror or two towards it. It will create the illusion of depth. While a series of small mirrors look great, generally speaking, it’s better to use large mirrors when trying to make a small room look bigger. In a small room avoid using furniture and accessories with added details like fringe, ruffles, tassels and other unnecessary decorative details. Drapery panels should be simple without fancy tiebacks, pillows shouldn’t have tassels hanging from them, and fabrics should be smooth without any added textural details. Much like furniture, it’s better to use fewer but larger pieces of art. Use artwork to create a focal point and place smaller pieces in larger frames. Photographs that are displayed in large frames with wide mats create a sense of space. Gallery walls are still an option, but instead of using many small pieces grouped together use fewer pieces with wider mats. The effect will be the same but the space will feel less crowded. The most important thing to remember is to only include pieces you really love. Don’t try to fill a small room with items you think you’re supposed to have. Analyze your lifestyle and include only what you need and what makes you feel good.